Any chance fixing the error with returned from running the Invoke-expression bit at the end ? Awesome script thanks for sharing! ...but when I try calling CreateRemoteThread (I'm running as admin) on the process (it's running under SYSTEM), I get an 'error 8' from GetLastError() : Not enough storage is available to process this command. Just going to leave this here in case anyone might find this useful. I was inspired by Dave Kennedy and Josh Kelly's presentation from DC18 - "PowerShell OMFG." 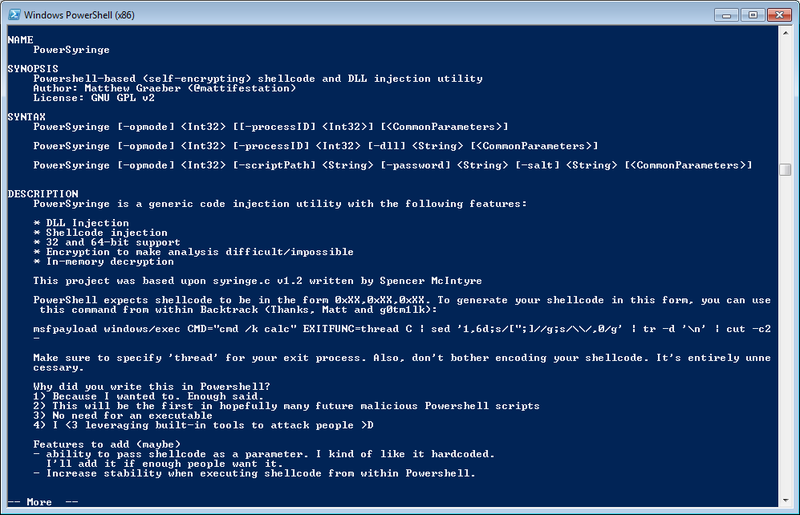 You could say it was the genesis of my interest in utilizing PowerShell as an attack platform. I ran into a few problems with your script. I could not get the script to inject x64 meterpreter (reverse_tcp) payloads into 64 bit processes. Whenever I try to inject the DLL, I receive Error: You can't inject a 32-bit DLL into a 64-bit process on Windows 7. However, same techniques work like a champ on 32-bit Win7 machine. For whatever reason, it keeps recognizing metasploits 64-bit payloads as 32 bit processes. I've run into the same issues with your replace-x64-process script and metasploits 64-bit executables. Also created my own C program, created 64-bit shellcode using msfencode (x64/xor) and still received the same problems. Have you seen this problem as well? If so, how did you resolve your issues? Before getting into any issues with the script, I want to make sure you've diagnosed everything. 1) I assume you ran PowerSyringe from a 64-bit instance of PowerShell, right? 2) Did you know that windows/x64/meterpreter/reverse_tcp actually generates a 32-bit dll? You can confirm this with any PE editor. That's why you're getting your error. I assume the payload in the 32-bit dll simply downloads and loads the 64-bit metsvc.dll. As a test, confirm that you can inject a standard Windows dll from system32. 3) Are you using the old PowerSyringe or are you using the latest scripts from PowerSploit? Significant code changes were made in the subsequent releases? 1.) Yes, 64 bit of powershell. 2.) Yes, was aware of the 32-bit dll factor. Thought that I had seen somewhere, perhaps it was not your blog, that a 64-bit meterpreter payload was injected just fine. I am able to inject a legitimate 64-bit dll as well as simple Hello World DLL without issues. I guess my next step will be to create a wrapper for shellcode and inject that. 3.) Yes, I am using your old version. I will try it with the Powersploit tools. 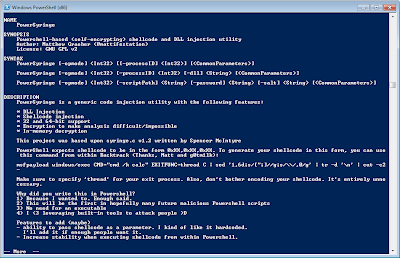 do you know nishang for powershell pentesting ? take a look , very usefull scripts i thinnk. Tried the copying/pasting [of script] at PS prompt but I'm afraid that didn't work either. Any help is greatly appreciated.